Have you ever tried to find a belt for a young child? We have had to do this many times. If you can find kids belts, there are very few to pick from. Typically, the ones that are available are tough even for an adult to use. Imagine how this will work with a toddler that is recently potty trained? It is an accident just waiting to happen. 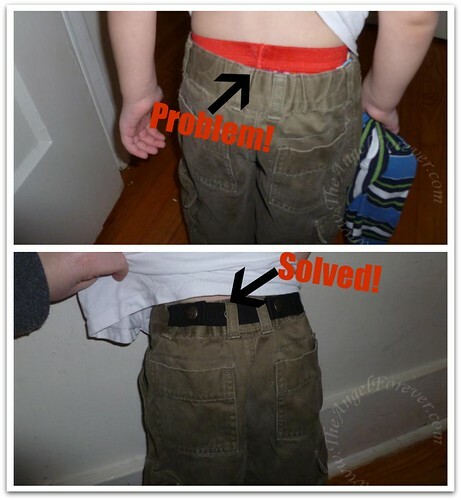 A while ago, I heard about a product called Dapper Snappers that helps to solve the kids belt dilemma. I was very intrigued about it. It seemed like a great product to assist my newly potty trained three year old, along with my older son that has some fine motor trouble with belt buckles. Thanks to Family Review Network, I recently had the opportunity to test out one of their boys belts. The other day, JSL (3) came running across the house and nearly tripped over his own two feet. TechyDad noticed that his pants were around his ankles. When I went to take a closer look, I saw his underpants. These nice pants, that had once been NHL’s, were not going to work. Normally when that happens, I change to another pair since we can not use a kids belt with him. He is too little to maneuver them on his own, and they really don’t make many. This time I had another choice. Two days earlier, my complimentary review sample from Dapper Snappers arrived. I barely managed to hold JSL still long enough to snap a before and after photo. He’s a three year old that is constantly on the go and not into photos these days. For the rest of the day, we never had any issues with JSL’s pants. He was able to use the facilities without a problem. We pretty much forgot that the Dapper Snappers were there until the end of the day (not a bad thing mind you). I seriously wish that I had purchased some Dapper Snappers when they first came out and I heard about them. They would have been fabulous to use when NHL was receiving occupational therapy. Oh well, at least we have them now to help with the little guy when we need them to give more life to a pair of otherwise too baggy pants. Thank you Dapper Snappers for helping to cure the droopy drawers within our lives! Disclosure: This post was written for Family Review Network & Dapper Snappers who provided the complimentary product in exchange for my honest review. No other compensation was given and all opinions are 100% mine. Thanks for writing about this product! I’ve been struggling with the whole belt thing–just doesn’t make sense to have a belt on a child that needs her diaper changed often (and struggles each time because she HATES it!). Too much effort! My solution has been to just have her wear leggings, but it pains me to see all of her cute little jeans and camo pants get bypassed. Problem solved!